Causation is an essential element in any personal injury claim. Causation requires the plaintiff to establish that the defendant’s actions constituted the proximate cause of their injuries. This has two separate requirements: proving that the defendant’s actions were the cause-in-fact of the plaintiff’s injuries as well as showing that policy considerations support a finding of liability against the defendant. To prove cause-in-fact, a plaintiff must show that something is a substantial factor in bringing about the injury. To prove the second element of a proximate-cause analysis, a plaintiff must show that there is a sufficient connection between the defendant’s conduct and the injury, and also that the defendant should be held accountable in light of public policy considerations. Recently, a federal district court of appeals issued a decision in a case brought against Apple due to its alleged role in a distracted driving accident. The court’s recitation of the facts is as follows: A woman received a text message while she was driving a pick-up truck on a Texas highway. The woman diverted her eyes away from the road to read the text message, and as she looked back up the road, she crashed into another car. As a result of the accident, two adults were killed and a child was rendered a paraplegic. The woman was using an Apple iPhone 5. Evidently, several years before the accident, Apple had obtained a patent for a lock-out mechanism for smartphones, which would prevent users from receiving text messages while driving. The lock-out mechanism was specifically designed to address the dangers of texting while driving. However, the plaintiff’s iPhone did not have the lock-out mechanism installed on it at the time of the crash and it was not standard equipment on any Apple phones at the time. The victims’ representatives brought a claim against Apple claiming negligence and strict products liability. The plaintiffs argued that Apple failed to warn iPhone users about the danger of distracted driving, and failed to put in the lock-out mechanism for texting while driving. The plaintiffs claimed that Apple was liable for the accident because receipt of a text message triggers “an unconscious and automatic, neurobiological compulsion to engage in texting behavior.” Apple argued that the plaintiffs’ claims should be dismissed, and the judge agreed, granted the motion. The plaintiffs appealed the trial court’s decision to a higher court. The federal court of appeals had to decide whether, under state law, a driver’s neurobiological response to a smartphone notification could be the cause-in-fact of a crash. The plaintiffs were required to prove causation, including that Apple’s conduct was a “substantial factor” in causing the injuries in the case, which would not otherwise have occurred. The court explained that in dram-shop claims, defendant businesses may be liable for injuries caused by overserving customers alcohol. 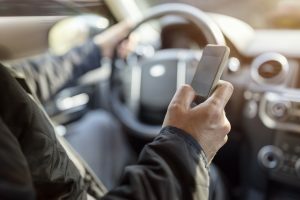 The court distinguished those cases from this case, because it explained that liability in those cases was created by state legislatures and because that danger has been recognized for longer than the danger of texting while driving. As a result, the court determined as Texas law stands today, a smartphone’s notification cannot be a substantial factor in a smartphone user’s conduct, and Apple could not be held liable for the crash. Importantly, although the case was handled by a federal appellate court, the court applied Texas law. Thus, the decision may not be indicative of how a California court would decide the issue. If you or a loved one has been hurt in a California car accident, you may be faced with physical, emotional, and financial turmoil. If someone else is to blame for your injuries, you may have grounds to file a lawsuit. The Neumann Law Group handles cases involving California motor vehicle accidents, aviation accidents, boating accidents, and pedestrian accidents, as well as other personal injury claims. We represent injured individuals in the Los Angeles and Orange County areas, and across Southern in California. We provide trustworthy and experienced legal representation to personal injury victims in all types of California personal injury matters. Call 213-277-0001 to schedule your free consultation today. California Appellate Court Discusses the Sudden Emergency Doctrine in Recent Road Rage Case, California Injury Lawyer Blog, November 29, 2018.